Following a combined donation of more than $9,000 to Homes for Our Troops from AmericanMuscle and its friends and business affiliates, the charity sent the following letter of appreciation. We wanted to pass it on to you since the donation was fueled by funds raised at the AmericanMuscle.com Car Show and Charity Event on July 19, 2009. So thanks also go out to our loyal customers for helping us support this noble cause. Let’s all make sure to do it again next year. Please allow me to express our sincerest thanks and gratitude to you for your successful fund raising efforts for Homes for Our Troops. We are both very honored and proud to include AmericanMuscle as one of our successful fund raising groups. Your generous donation will allow us to assist our more severely injured veterans and their families by building the specially adapted homes they deserve with no cost to them. Your success in not only making your goal but exceeding it as well as showcasing our cause will help rebuild the lives of our nation’s heroes. We would like to thank you again for your dedication to suppiorting the brave men and women who make sacrifices every day for our freedom. Your support for Homes for Our Troops, Jeff, is greatly appreciated, and we look forward to working with you again on your next event. I am a very lucky person to say that I belong to two of the greatest groups of people in the world: a mustang owner and a Soldier. 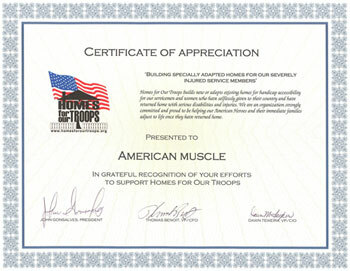 Seeing a partnership between AmericanMuscle.com and Homes for Our Troops is commendable and respectable. Your donation will directly impact the lives of wounded Troops in a very positive way and your contributions mean more than you can imagine, and for that, I personally thank you for your efforts. I commend American Muscle for their generous contribution. Although I am not in the military myself I do have two close friends that are. I know how much they have done for our country and it is an amazing thing to give back to our troops. Remember Freedom is not Free. I am also Proud to be a soldier and a MUstang owner I have wanted a Mustang since i was a child and now i have Purchased my Mustang GT 45th year aniiversery edition and I am currently deployed downrange, I am glad that American Muscle has done this for the wounded soldiers, Commendable Thanks and please people keep Suopporting us There are about 23,000 wounded soldiers due to Iraq and Afganistan we need your support!! I am a U.S. Marine and 03’ Cobra Owner. We are in Iraq and Afghanistan to protect our way of life and you’re all doing your part to make that easier for us, thank you. Please continue supporting us, we are all in one team. I would like to thank American Muscle for taking on such a worthy cause. If it were not for our Troops ,we would not have the lives we all live . I was glad to be in the show and show my support for the troops. Many people seem to forget why we live like we do. IT’S THE TROOPS AND GOD BLESS THEM ALL !!!! Being a soldier and mustang owner. I want to say thank you for your support and all the great deals on parts. I am currently deployed and can’t wait to get back to my brand new 2010 Mustang GT. Thank you guys and God bless. Really beneficial stuff. Over-all, I do think this is worthy of a book mark, many thanks!